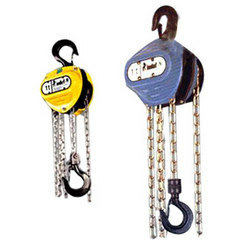 Backed by a modern infrastructural base, expertise of our in-house engineers, and rich experience, we have established our presence as the most reliable organization for offering a wide gamut of Chain Pulley Block. Used in various heavy dusty industries like molding, dyeing and casting, this block is assembled with screw & friction disk type brake that ensures full safety at all positions. Keeping in mind the diverse requirement of our clients, we offer this range of block in several specifications. SAHJANAND INFRATECH a pioneer manufacturer of material handling & lifting equipments,PEB structure and Prefabricated structures in Vadodara & Ahmedabad.Our key person’s vast experience in the field 0f material handling equipments like electrically Operated Overhead Cranes for more than a decade is the vital strength of the organization .Our accomplished engineering production and sales force can attend to any sort of handling and lifting requirements and will offer advise and implementation on up to date, latest innovative designs and solutions to meet newer challenges. A focus approach on research and development has enabled the company to consistently innovate and constantly improve its product line by delivering more features and better performance at lesser costs.Latest technology , manufacturing excellence, customer service, risk management and comprehensive product range all vouches for that you buy SAHJANAND product, you buy more than product, you buy quality.